Top Notch Material: Nickelodeon Favorites: Celebrate Fall! Squeeee! It is almost that time folks! The pumpkins, the brisk night air! I cannot wait and neither can Nick Jr as they just released a new DVD called Nickelodeon Favorites: Celebrate Fall! Both of my little guys have been watching this movie almost non-stop and adore every single episode. Of course they do, because this DVD features all of their favorite shows! Beach parties may be over, but autumn fun and adventures are just starting in Nickelodeon Favorites: Celebrate Fall! This exciting collection includes over two hours of seasonal and educational episodes from Nickelodeon's most popular shows including PAW Patrol, Blaze and the Monster Machines, Wallykazam!, Bubble Guppies, Team Umizoomi and The Fresh Beat Band. From exploring corn mazes to helping out friendly ghosts, these adventures are sure to entertain the whole family. 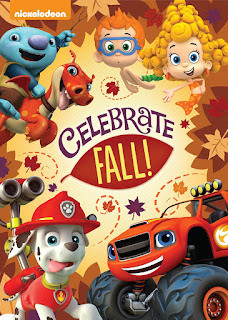 Created by Nickelodeon and distributed by Paramount Home Media Distribution,Nickelodeon Favorites: Celebrate Fall! will be available on DVD on August 18, 2015 for the suggested retail price of $14.99. PAW Patrol: Pups Save A Talent Show/Pups Save The Corn Roast-Rubble and Marshall are going to lead the PAW Patrol band in the Adventure Bay talent show! Will the pups be able to rescue Farmer Al first and get to the show on time? When Bettina accidentally turns a corn maze into a popcorn maze, spy Chase and Marshall must pop to it to save Chickaletta and stop the popping corn! Blaze and the Monster Machines: Truckball Team-Up - Blaze discovers an exciting new sport called Truckball. When Crusher and his team of cronies challenge him, Blaze must scour all of Axle City to put together a Truckball team before the big game. Wallykazam! : The Explorers Club - Wally and Ogre Doug start a club for explorers and set out to find the rare Chickephant. Trouble brews when Bobgoblin starts a rival club with Hattie the Witch. Bubble Guppies: Gobble Gobble Guppies! - Molly and Gil can't wait to pick their favorite pumpkins, but when they lead everyone to the pumpkin patch, the pumpkins are gone! Their turkey friend Giblet leads them on a harvest hunt to find the culprits: the pumpkin patch pirates! Team Umizoomi: The Ghost Family Costume Party - It's Halloween and nobody is more excited than the team's newest pal...the hilarious Little Ghost! Every year, all the funny ghosts get together for the big Ghost family costume party. Little Ghost can't wait to get there and show everyone his silly costume, but first Little Ghost has to figure out four Halloween riddles! Team Umizoomi use their mighty math powers to help Little Ghost find the old house, climb a tricky staircase, sneak past a black cat, rearrange some talking pumpkins and make it to the party just in time for the big surprise. The Fresh Beat Band: Giant Pumpkin - Shout picks a giant pumpkin for the Fall Festival, but it's too big to move by himself so the Fresh Beats work together to move it. They get to the festival in time and perform as a quartet with their giant pumpkin!